The original Italian Pegasus. Compared to the Greek version, this one comes in the standard-sized box used for most of the steeds. It sports hard-tipped missiles like the original Micronauts steeds. 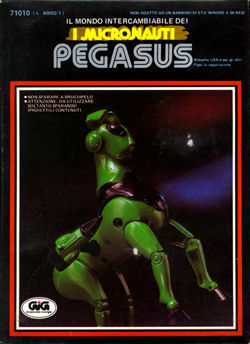 Pegasus is Green Baron's beast of burden and the two of them do a nice Wonder Twins act to take on the form of a Centaur, or even a Centaur with wheels!